We’d love your help. Let us know what’s wrong with this preview of The Writing Desk by Rachel Hauck. With pressu From the New York Times bestselling author of The Wedding Dress comes a new captivating novel of secrets, romance, and two women bound together across time by a shared dream. To ask other readers questions about The Writing Desk, please sign up. I had a very hard time connecting with this book. The premise held such promise for me, but the story fell flat. The story is told through two timelines – if I could, I would rate the ‘past’ timeline 3.5 stars and the ‘present’ timeline 1.5 stars. I didn’t like any of the characters in the present day story. The main character, Tenley, bothered me the most. I found her character whiny, spoiled and rather annoying. The housecoat was one of the most irritating and unbelievable parts of this story – it made me want to scream! I didn’t believe in her passion to be a writer – it didn’t seem true or fitting to her character. Her interactions with her mother were awkward (as I know they were intended to be) and added to my dislike of the present day story. The story from the past was much more interesting and entertaining, although my enjoyment of it faded as the novel progressed. I simply lost interest. Perhaps it was just a timing thing, but this novel missed its mark with me. I know I am in the minority, so please be sure to read the many other raving reviews on this novel! A big thank you to NetGalley, Thomas Nelson Fiction and Rachel Hauck for a copy of this in exchange for an honest review!! Wow! I couldn't put this book down... I loved it! Rachel Hauck hit it out of the ballpark with this captivating story about 2 women trying to find their way in this world. You will find moments of laughter and sadness with hidden dreams that were lost and found. This was absolutely flawless! Birdie lives in the early 1900s and has a strong love for writing. Her mother is very controlling and has specific plans for Birdie's future, she wants her to marry a man for money instead of love. But, Birdi Wow! I couldn't put this book down... I loved it! Birdie lives in the early 1900s and has a strong love for writing. Her mother is very controlling and has specific plans for Birdie's future, she wants her to marry a man for money instead of love. But, Birdie has other plans for herself, her dream has always been to write a novel and have it published. Unfortunately, in the early 1900s, she was told women don't write books and faced social backlash. Birdie found an escape from her mother in the attic where she had a special desk she did all her writing on. Tenley comes from a family of writers where she followed in her father's and great great grandfather's footsteps. Her first book was a success and now she is riddled with fear that her second book won't be as successful. Just as she is about to pen her second book her estranged mother calls and asks Tenley to help her while she undergoes chemotherapy. Tenley agrees in hopes a change will help her get over her writer's block. While staying with her mother Tenley uses an antique desk to write her new book - the same desk Birdie used 100 years ago. This is a beautiful story of forgiveness, overcoming fear, and developing a deep faith in God. The Writing Desk by Rachel Hauck really captivated my attention. Very hard to put this fast paced page turner down!Featuring a dual time line, which I love in books the stories take place a century apart but actually have a connection. Two very strong women are trying to prove themselves in the writing world. Birdie,is from old money and was born during the Gilded Age. I just loved the rich and sumptuous descriptions here and the elegance. 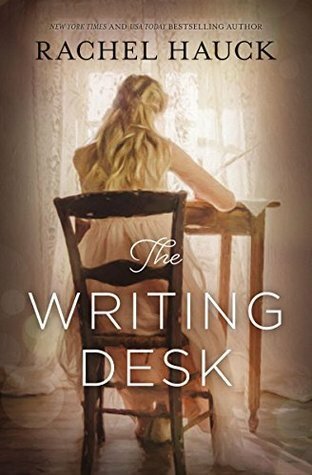 She uses the desk to pour out her thoughts and fears but The Writing Desk by Rachel Hauck really captivated my attention. Very hard to put this fast paced page turner down!Featuring a dual time line, which I love in books the stories take place a century apart but actually have a connection. Two very strong women are trying to prove themselves in the writing world. Birdie,is from old money and was born during the Gilded Age. I just loved the rich and sumptuous descriptions here and the elegance. She uses the desk to pour out her thoughts and fears but she has a very controlling and manipulative mother who makes Birdie pay for her,(the mother's mistake). Coming out into society was all about you associated with and it must be high society. Her mother wants to force her to marry someone against her will to further her high society ranking not caring That her daughter has no feelings for this man. Fast forward a century, After an amazing best seller, Tenley is expected to produce another best seller by the quickly approaching deadline. Her writer's block is not helped by the stress she feels. Her boyfriend is pressuring her to marry him and she's just not feeling it. She doesn't have a close relationship with Blanche,her mother who abandoned the family when Tenley was a young child. Being raised by her father caused her to feel neglected and abandoned by her mother. She is in a tug of war when her boyfriend asks her to go to Paris with him so he can work on his screen play at the same time her mother asks her to go to Florida to help her get through her chemotherapy. The pressure mounts from her publisher as her writer's block continues. She is using the same desk to write on that Birdie used and she find something amazing in the stuck middle drawer. My take on this is don't settle in life. Go for what's important and that you know is right even if it involves waiting and never marry for any reason but real,true love. Money and material things are just things but true love will sustain you! An intriguing story, set on a dual timeline, featuring two fledgling writers a hundred years apart. A stand alone novel with characters whose stories seem unconnected, except by an old desk. The past story begins in 1902-3 New York, among the social elites, the old "Knickerbockers". In a time when American heiresses were being matched up with English Lords who had titles and estates in need of cash flow, Birdie is under a lot of family pressure to marry according to her family's wishes. All she An intriguing story, set on a dual timeline, featuring two fledgling writers a hundred years apart. A stand alone novel with characters whose stories seem unconnected, except by an old desk. The past story begins in 1902-3 New York, among the social elites, the old "Knickerbockers". In a time when American heiresses were being matched up with English Lords who had titles and estates in need of cash flow, Birdie is under a lot of family pressure to marry according to her family's wishes. All she really wants to do however is be free to write her stories. The present day tale is centered on another young writer who is under a deadline to produce her next novel. Coming from a family of successful writers adds even more pressure, then a call from her absentee mother to come help her through a health crisis seems to be the final straw. I love how this author adds a twist or two along the way, with a bit of mystery and romance, tying both stories together in surprising ways. It took me awhile to engage with these characters, but it became more interesting as it went. Giving both stories a divine thread through a song resonating in the character's soul, reassuring them of a divine presence, was a lovely way to connect them, as they hear, "Do not be dismayed, you don't have to worry or be afraid." I love the thought of God singing over his people, like it says in the book of Zephaniah. I liked the fun dialogue between Tenley and Jonas, and how accepting he and his family were of her quirky ways, helping her with her mom, and showing her a lot of grace. Birdie was an interesting character too, trying to please her parents, but not give up her dream of being a writer. I wasn't sure how either story would end or how they would connect. The mystery kept me reading on, hoping they'd both have happy endings. It was a satisfying conclusion and worth the wait. This dual-timeline novel pulled me into its pages and simply didn’t let go! When I finished the book, I felt as if I’d lived two different lifetimes. Both stories, present and past, were so compelling. I enjoyed the contemporary storyline and wondered how things were going to work out for Tenley. She seemed to be digging herself into a hole as she struggled to be the amazing author that everyone touted her to be. And the Gilded-Age story from the past…romantic sigh!!! I just absolutely did not s This dual-timeline novel pulled me into its pages and simply didn’t let go! When I finished the book, I felt as if I’d lived two different lifetimes. Both stories, present and past, were so compelling. I enjoyed the contemporary storyline and wondered how things were going to work out for Tenley. She seemed to be digging herself into a hole as she struggled to be the amazing author that everyone touted her to be. And the Gilded-Age story from the past…romantic sigh!!! I just absolutely did not see how things could possibily go right for these two people who were so in love, yet unable to devote themselves to each other. Birdie’s story completely captured me! I’ve found myself thinking of the characters in this book many times over the past few days. This was definitely an intriguing read! I simply loved this book! The plot seemed so very original. For an avid reader, sometimes it seems so many books are so familiar, but not this read. The characters seem so real. Tenley, Jonas, Birdie, Eli, and the secondary characters are all wonderful and create a great story that centers around an old desk. I love books that switch back and forth to different time periods. This book was like a layered dessert.The first bite begins, and you enjoy it. As I delved further, each layer is more bewitc I simply loved this book! The plot seemed so very original. For an avid reader, sometimes it seems so many books are so familiar, but not this read. This book was like a layered dessert.The first bite begins, and you enjoy it. As I delved further, each layer is more bewitching and more enjoyable than the last...until I found I couldn't stop. I was totally taken in. I was the characters. I was part of the story. I was in the time and place without the ability to stop until I arrived at the delicious end...with a tinge of sadness that it had ended at all. It truly was a remarkable story with a wonderful faith thread woven throughout. This one definitely earned its place on my forever shelves. The Writing Desk has inked its way onto my favorites list – for 2017, of course, but also the all-time fave comfort books that I pull out and reread when I’m feeling blah or when I just need the hug of the familiar. Tenley and Birdie in many ways are versions of each other in another era. At least at their core. When it comes to love. When it comes to their mothers. Connected through time via one man, a host of novels and a writing desk, Birdie and Tenley have a story for all of us. Of what it me The Writing Desk has inked its way onto my favorites list – for 2017, of course, but also the all-time fave comfort books that I pull out and reread when I’m feeling blah or when I just need the hug of the familiar. Tenley and Birdie in many ways are versions of each other in another era. At least at their core. When it comes to love. When it comes to their mothers. Connected through time via one man, a host of novels and a writing desk, Birdie and Tenley have a story for all of us. Of what it means to be a woman. Of what it means to love a man. Of what it means to follow your dream, to be honest with yourself and to find ‘home’ in the arms of a Savior. And then of course there is Elijah. And Jonas. Two men, separated by time and about as opposite from one another as can be. Yet they too are connected through the women they love – and through the men of integrity that they are. Rare in Elijah’s time. Rare in our own. Elijah (Eli) sends readers swooning with his long-held love for Birdie, his commitment to do the right thing, and of course his British accent. And Jonas will have book boyfriend collectors everywhere scrambling to add him to their collections; his heated kisses combined with his commitment to wait ‘for the right girl and marriage’ will tempt even the least romantical reader to read this book from the safety of the nearest fainting couch. Bottom Line: Two stories. Two women. Connected by time and separated by it, all at once. Tenley’s wit and adorableness (in spite of her searching heart) endears readers immediately, and Jonas’ ability to ‘wit’ right back seals the deal. Her growth through the story is skillfully and gently penned, the simplicity of grace vibrant against the backdrop of faith. The Writing Desk is fun, tender, heartwarming, and inspiring. All wrapped up in a captivating story that you’ll want to hug when finished reading. (Don’t ask me how I know this.) One of Hauck’s best, and that’s a high standard to meet since everything she writes is exquisite. This one will be on my favorites list for years to come! I don’t want to fangirl over this book so much that you all ignore what I have to say. But, I loved this book so much that I think the only way to adequately describe my feelings is to share my facebook status that I posted just after I finished reading. Okay, my bookish peeps… I rarely demand you go buy a book but I sat here blubbering like a kid over this ending. You cannot miss this book. You can’t! Like, go buy it or we can’t even be friends!!! I fell in love with the characters, with I don’t want to fangirl over this book so much that you all ignore what I have to say. But, I loved this book so much that I think the only way to adequately describe my feelings is to share my facebook status that I posted just after I finished reading. I fell in love with the characters, with Tenley and Jonas but most of all with Birdie. She reached right through the pages and gripped my heart and gave it a good squeeze. One word sums up these characters—endearing. I think most people who read my blog knows that I rarely read contemporary fiction. When I do, Rachel Hauck’s books are the ones that I pick up. Yes, I’m a fan. Make no mistake though, this book is fantastic and I’m not saying that just because I enjoy this author’s work. The interesting thing about The Writing Desk is the duel timeline. Most authors cannot pull off a duel timeline but Birdie and Tenley’s tales were so beautifully woven together. Their lives were connected in a way that left me reeling. Their connection was beautiful and I kept turning the pages to see where the story would take me. Lastly, I want to say how much I appreciate this author’s authentic tale of loss, love and redemption. This book was bittersweet and the characters were flawed. They were real—as real as a book character can be. I hate to be on repeat but this book was just lovely and I truly think anyone that loves a sweet, clean romance would love this story. It’s not overly preachy and I think some devout Christians may want more. But, I like seeing the subtle hand of God working in the lives of those that need redemption. This book had the perfect amount of romance and faith elements for me. It felt authentic and not as if the author was trying to beat me over the head with a full plan of salvation. She let God find her characters where they were and I loved that. Truly, I loved this book. A complimentary copy of this book was provided by Harper Collins Christian Publishing, the author. I was not required to write a positive review, and have not been compensated for this. All opinions are my own. I finally understand what everyone has been raving about! I may be a late bloomer but I'm definitely on The Writing Desk's cheer team now! Especially cheering because this is a dual timeline story. Birdie with all the pressures of belonging to the upper class during the Gilded Age and Tenley with the pressures of living up to the expectations that come from belonging to a literary family. There are interesting parallels in these two heroine's stories though a century separates them. Difficult mo I finally understand what everyone has been raving about! I may be a late bloomer but I'm definitely on The Writing Desk's cheer team now! Especially cheering because this is a dual timeline story. Birdie with all the pressures of belonging to the upper class during the Gilded Age and Tenley with the pressures of living up to the expectations that come from belonging to a literary family. There are interesting parallels in these two heroine's stories though a century separates them. Difficult mother/daughter relationships and both chasing dreams as they find the courage to be true to themselves. And then there are the men in their lives. Blissful sigh. Elijah in the historical timeline and Jonas in the contemporary one. Men of integrity and faith. Elijah determined to do the honorable thing for his family's estate despite his love for Birdie. Be still my heart. This star-crossed lovers story had me on tenterhooks! I'm still having heart palpitations over steadfast, easy-going, steeped-in-faith Jonas. And I'm guilty of feeling like Tenley didn't deserve him in the beginning. But Jonas proved me wrong and humbled me in the process. Because he looks past the baggage and insecurities and sees Tenley as the beautiful daughter of God she is. Their witty dialogue still has me smiling. So much fun in the give and take between these two. But so much heartache too. And so much hope as Tenley finally begins to grasp the concept of grace and the hope it can bring to her future. With pressure mounting from her publisher, Tenley is weighted with writer’s block. But when her estranged mother calls asking Tenley to help her through chemotherapy, she packs up for Florida where she meets handsome furniture designer Jonas Sullivan and discovers the story her heart’s been missi Tenley Roth’s first book was a literary and commercial success. Now that her second book is due, she’s locked in fear. Can she repeat her earlier success or is she a fraud who merely found a bit of luck? I have always loved Rachel Hauck's books and will buy a book with her name on the cover automatically. This one was no different. Hauck moves effortlessly between the Gilded Age and the present time and the times in between. The reader is engaged to a degree that it's hard to put the book aside. I was rooting for Birdie and hurting for her at the same time. Goodness, what depth of emotion Hauck writes! All through the book, the theme of God whispering, 'Do not be dismayed' resonates. Even to His children today, that phrase still resonates. God cares about our every problem and cries out to us to never fear for He is there. As always, Hauck's books carry a strong spiritual theme, a fact for which this reader is very grateful. Don't miss this one, folks. It will carry you away! I loved this Tenley wrote an amazing best seller. Her father and grandfather were also best selling authors. So with the deadline for her next book looming, Tenley must make up her mind, go to Florida to help her estranged mother or go to Paris with her boyfriend. She needs inspiration to remove her roadblock. What she finds is nothing like she expected. An old desk with a stuck drawer, a local carpenter who wants the desk, and renewed relationships help change Tenley in ways she never imagined. This is a sweet story, with split time stories one involving a debutante in the Gilded Age and the other modern day. In classic Rachel Hauck fashion the stories intertwine in unique ways with characters I loved. I thoroughly enjoyed reading this novel. Hauck has penned another gorgeous story about two female writers, separated by time and circumstance. Spiritual content is beautifully integrated and makes the story meaningful. Mistakes and heartbreak are a reality in the tale, as in life, and make the characters relatable. Attention to historical detail places the reader in the midst of early 1900s New York with all of its challenges, especially for young women like Birdie who have dreams that go against the acceptable choices of the era. This superb book will entertain and make readers think. This book was amazing. I can't say enough about it. I absolutely adored it. There is something about the way that Rachel Hauck writes that just pulls me into her books. I get lost for hours. As much as I've loved her Royal Wedding series, her stand alone novels are probably the ones that stay with me. I love the depth of the past meeting the present. I love how the main character, Tenley in this case, has to make a decision that is similar to the one Birdie is forced to make. I love how each woma This book was amazing. I can't say enough about it. I absolutely adored it. There is something about the way that Rachel Hauck writes that just pulls me into her books. I get lost for hours. As much as I've loved her Royal Wedding series, her stand alone novels are probably the ones that stay with me. I love the depth of the past meeting the present. I love how the main character, Tenley in this case, has to make a decision that is similar to the one Birdie is forced to make. I love how each woman makes her choice for certain reasons, but was it necessarily the right one? I love the depth that is Tenley and Birdie's characters. Both are not shallow characters. I love how they each either learn or not from the circumstances that they are presented with. Some authors can draw a reader in. Others can make the story linger long after the book has ended. Ms. Hauck is one who has managed to do both with this book. I received a copy of this book for free from the publisher in order to share my honest opinion. My thoughts and opinions are my own. I was not required to like the book, only honestly give me honest opinion. In this book the author tells a story of a woman striving to prove herself to others and to her own self. I loved how Rachel Hauck gave us a glimpse of life in the 1900s and the struggles it was to be a young girl wanting to be and do what she felt called to do, not what society or family told her she should do. Within this story Rachel Hauck also wove the life of a young girl in the 21st century who has connections to the past. Both girls were striving to find out who they were and what their li In this book the author tells a story of a woman striving to prove herself to others and to her own self. Both girls were striving to find out who they were and what their life should be like. It’s a wonderful story of acceptance, and love. This book flowed with beautiful word pictures and captivating conversations. Another brilliant dual time romance from Rachel Hauck featuring great characters and an intricate surprising story. I think it may even be my favorite of hers yet! Two stories in one! This was a fun one! I love Rachel Hauck's books and when I see one offered, I immediately push the "request button". However, this one, not so much. It was still a good read, but I just didn't feel the connection with the characters as much as I usually do when I read her books. I did, however, love Birdie. Her ambition and heart had me rooting for her throughout the whole book while she went through the trials of her daily life. And, what a life! A woman who only wanted to write and to marry someone she loved. Her I love Rachel Hauck's books and when I see one offered, I immediately push the "request button". However, this one, not so much. It was still a good read, but I just didn't feel the connection with the characters as much as I usually do when I read her books. I did, however, love Birdie. Her ambition and heart had me rooting for her throughout the whole book while she went through the trials of her daily life. And, what a life! A woman who only wanted to write and to marry someone she loved. Her mother was dead set on that idea from the very beginning. She was determined, whether Birdie loved them or not, that Birdie would marry a man worthy of the union of marriage through wealth and prestige. In that sense, Birdie's mother only goal left in life was to insure that Birdie marry the man she had picked for her. A man who was a huge flirt and would undoubtedly cheat on her time after time. Birdie's story was absolutely a great one. However, Tenley, the present day woman who had written a best selling novel and was having a very hard time with her second book was somewhat like her name. Tenley, for me, was tenous. A self-absorbed character who was always "woe is me". When in actuality, she had everything. Her constant whining was really grating one me. I even preferred Tenley's mother over Tenley. And Tenley's mother was portrayed more as self centered than Tenley. There were lots of times when I would wish that the book was going back in time to Birdie's life, one I liked reading about a lot more. All in all, it was still a good read and I did enjoy doing so. Of course, this by no means indicates that I won't push that "request button" again because I know I will! Honestly, I can't wait for the next one! I have read other Rachel Hauck books and they always leave me feeling happy. Her stories combine past experiences of her characters with the present in a way that helps us understand the meaning of "deja vu". The Writing Desk is no exception. Tenley Roth's first book has become a bestseller and now her publishers are expecting a follow up book to keep the momentum going. Fear and doubt creep in and so does writer's block. She is being pushed on all sides; her fiance, her mother. her past. When h I have read other Rachel Hauck books and they always leave me feeling happy. Her stories combine past experiences of her characters with the present in a way that helps us understand the meaning of "deja vu". The Writing Desk is no exception. Tenley Roth's first book has become a bestseller and now her publishers are expecting a follow up book to keep the momentum going. Fear and doubt creep in and so does writer's block. She is being pushed on all sides; her fiance, her mother. her past. When her estranged mother calls her from Florida with the news that she has cancer and needs her to come help her through her the chemo, she doesn't necessarily jump at the chance but decides that perhaps a new outlook and a new place may help her writer's block. There she meets Jonas, the man that may help her get the creative juices running again. She finds a beautiful desk at her mother's house that makes her feel as if it will help her tell her stories. In another time; during the Guilded Age Birdie Shehorn, another gifted author writes stories at the same desk. However, she comes from a rich family and a matriarchal mother who wants to make all decisions for her, including who she will marry. Birdie has struggles and decisions of her own in order to make her dreams come true. This book focuses on two women, Tenley's story takes place during modern times. Birdie's story is a historical. Tenley is floored, literally, when she receives a marriage proposal right before she receives a prestigious writing award. Suffering from writers' block, she struggles with making decisions - should she go to Paris with her boyfriend or travel to Florida to care for her estranged mom. Isn't it too late to try and fix their broken familial relationship? Birdie wants to publish her romance This book focuses on two women, Tenley's story takes place during modern times. Birdie's story is a historical. Birdie wants to publish her romance novel. But, her parents aren't aware of her writing aspirations. They want her to marry a well-to-do man that they've chosen. I almost felt as if Birdie had been born 100 years too early - she seemed like a modern woman. Both Birdie's and Tenley's stories are related in a unique and appealing way. This was a light, enjoyable summer read. Full review coming closer to release date, but this is Rachel Hauck's BEST BOOK EVER and I predict it will make everyone's best books of 2017 list. Could not have loved it more. PERFECTION! Wow, just wow. Beautiful story. Holt Armstrong: Tenley's unfaithful "fiancé"
There was humor within truly fun current-day storyline conversations. Jonas, Tenley and her mom had me laughing right out loud. Jonas was a middle income struggling furniture dealer in Cocoa Beach Florida. Tenley was from wealth in New York, a best selling author, now suffering writer's block. They met at her mother's house when the desk was slated to be sold, much to Tenley's great dramatic objection. There were also very sad family obligations during the Gilded Age storyline (1902-), into which Birdie was being forced. Her mother arranged for Birdie to marry Alfonse Van Cliff, also from great wealth and status. This union would set the family firmly in the highest of New York society. But Birdie wanted to become an author and free herself from this family obligation. Birdie's manuscript, which had been sent to Barclay publishing, disappeared. Her book was about the man she fell in love with on the family's last European tour. His name was Elijah Percy, the Earl of Montague. Because he was British, and not high enough in New York's elite society, he was rejected by her mother as a possible match for Birdie. After departing Europe their paths didn’t cross for quite a while. Her book rang far too close to the real story so her intention was to retrieve it. Where her manuscript turned up could change things. As it turned out, an arranged marriage was made for the earl at the same time. Estates were suffering in Europe during this period so a favorable financial match was arranged with a young American to save their lands. For her it was the benefit of marrying into nobility. But Elijah loved Birdie, and his heart hurt contrasting the woman he was to marry with the woman who owned his heart. Two very different women, Tenley and Birdie, separated by over 100 years and values they both needed to examine. I loved Birdie and Eli's romance in 1902. Even knowing that in just months they would be marrying others, they still prayed those weddings would crumble and true love would triumph. Sadly Birdie's mother was formidable and would win by any means. Very little of this book would place it firmly as Christian fiction. It could have been any book that didn’t talk about Christ’s saving grace. God, yes, or divine power, but not specifically Christ. More like Religious or Inspired fiction. Ah well, except for some heated kissing from which Jonas wisely drew away, this was a fairly clean story. There were some conversation topics that might not be consider honoring to the Lord since the current-day New York characters weren’t Christians. Tenley's character was worldly so she encouraged a little more of a "physical aspect" than Jonas wanted to as a Christian. Fortunately Jonas chose to he keep himself pure. As an author myself, the title of this book and the captivating image on the cover was enough to pull me onto the first page with ease. To find out a good portion of the book takes place in Florida was only made better when I discovered the town in Florida was Cocoa Beach, my metaphorical backyard. As a sophomore novelist struggling to find inspiration, Tenley is a relatable character with quirky habits, superstitions, and ideas about how to course correct her ship floating aimlessly in turbulent As an author myself, the title of this book and the captivating image on the cover was enough to pull me onto the first page with ease. To find out a good portion of the book takes place in Florida was only made better when I discovered the town in Florida was Cocoa Beach, my metaphorical backyard. As a sophomore novelist struggling to find inspiration, Tenley is a relatable character with quirky habits, superstitions, and ideas about how to course correct her ship floating aimlessly in turbulent waters of the authorial ocean. Even more so, the way Birdie is portrayed, and her strong presence as a woman in the early 20th century was both inspiring and motivating, to stand up for what one believes in, whether it's the pursuit of love, or the pursuit of loving what you do. Ms. Hauck does a wonderful job of capturing the language from a bygone era in a convincing and compelling way. The way each portion of the story (past and present) interleaved with the other created a plot that was well-crafted and well-presented. I recognize that this title was shelved in the Christian fiction section of my local Barnes & Noble, and I've read several titles from those same bookshelves in the past. I am certainly not averse to the presentation of theological values in a novel, but the level to which they were presented in this story went beyond what I was accustomed to. It didn't detract from my enjoyment of the story, but some of the references felt out of sync with the mood of the story, for this reader at least. Tenley and Birdie both got on my nerves a few times, especially with how weak-willed Birdie was for a relatively good portion of the story. In Birdie’s situation I can understand why she was more timid, but she was mainly a pushover. Alfonso—I almost couldn’t stand the man! Eli though, was amazing. Birdie’s mother drove me crazy. The woman was severely manipulative and her father was an odd mix of controlling and weak-willed. Tenley was definitely a lost soul with a crazy edge to her. I understand, she had a difficult background, but she still annoyed me a good bit of the time. But Jonas was a nice balm for that. I ended up liking Blanche throughout the story! A few of my student readers have said that this is Rachel Hauck’s BBE—Best Book Ever! New York Times, USA Today & Wall Street Journal Bestselling author Rachel Hauck writes from sunny central Florida. A RITA finalist and winner of Romantic Times Inspirational Novel of the Year, and Career Achievement Award, she writes vivid characters dealing with real life issues. Her book, Once Upon A Prince, was made into an original Hallmark movie. She loves to hear from readers. She also love New York Times, USA Today & Wall Street Journal Bestselling author Rachel Hauck writes from sunny central Florida. She loves to hear from readers. She also loves to encourage new writers and sits on the Executive Board of American Christian Fiction Writers..
A graduate of Ohio State University with a BA in Journalism, Rachel is an avid OSU football fan. She hopes to one day stand on the sidelines in the Shoe with Ryan Day. Visit her web site to find out more and click on the icons to follow her on Twitter and Facebook.